When all studies point to the benefits of mindfulness, it makes sense that you want to make it a practice in your life. But the best way to learn and practice mindfulness is not through reading a mindfulness book, but rather to start the formal practice of meditation. Mindfulness meditation the best way to train your mind to be attentive to the present and be impartial of negative thoughts. These are the qualities of mindfulness that made it an effective alternative remedy for stress and mental disorders. The growth of the internet and apps means this practice of thousands of years is integrated into modern technology in the form of mindfulness app. While traditional practitioners questioned the merits of learning mindfulness from an app, beginners keen to start their mindfulness journey have found mindfulness apps a useful tool. With hundreds of mindfulness apps available for download, getting the right one can be quite overwhelming. While the fundamentals of mindfulness are the same, the guidance directed towards a beginner may differ even in a traditional practice. It makes sense to consider these aspects before you download and subscribe to your first mindfulness app. A fancy app is pretty pointless if it is not developed from the experience of an experienced mindfulness practitioner. You’ll want the founder of the app to be a practitioner of both mindfulness and meditation for years or decades. The guidance from an experienced mentor means you’ll have an easier time getting started. It is going to be tough fiddling with an app that has the controls and contents littered all over the places. You’re going to get frustrated instead of learning mindfulness. You’ll need a mindfulness app that is intuitive and user-friendly. A neat and organized content layout would triumph over fancy graphics animations. Learning mindful breathing is basically what all beginners will experience. But if you’re hoping to direct mindfulness to address specific issues in your life, then some mindfulness apps may suit you better than others. For example, Aware is a mindfulness app built to help with mental disorders like stress and depression. Mindfulness is not a miracle therapy that will rid you of your problems in a couple of days. It is a practice that needs consistency before your mind undergoes any positive changes. A mindfulness app that features daily sessions and tracker tool will be helpful to keep your momentum going. While there are free mindfulness apps that you can download, paid mindfulness apps are often superior, in terms of their content and design. The cost of a mindfulness app should justify the value that it offers. The good news is, most paid mindfulness app offered a free trial for a limited period. No two mindfulness apps are the same. With each touting their own features, getting the right fit on the first try can be tricky. To help you with that, I’ve compiled this list of top mindfulness app that has been helped hundreds of thousands with their mindfulness practice. Headspace is arguably the most popular app when mindfulness is concerned. The founder of Headspace, Andy Puddicombe spent 10 years practicing meditation as a Buddhist monk. With the aim to help improve the health and happiness of every individual, the Headspace app was launched in 2012. The Headspace app spots a creative design, with colorful themes and characters giving a fun aspect to mindfulness. Navigation is simplified with only 3 tabs, Home, Discover and your personal stats. The meditation contents are properly arranged and accompanied by helpful descriptions. There are 3 types of guided meditation in Headspace; Minis, Packs, and Singles. The Minis are short mind exercises that range from 1-3 minutes to inject some mindfulness into your busy schedule. Packs are a series of guided meditation tracks that focus on various areas of your life including health, happiness, and work. The app also has one-off mindfulness sessions called Singles to make mindfulness a routine in your life. Headspace also has a special section that offers guided mindfulness for kids. You can select the age of your kids and the relevant mindfulness track will be displayed. Text and pure audio can be slightly dull to motivate a beginner to be mindful. Headspace’s creative team shines with brilliantly produced animation clips. The animations feature Headspace’s iconic cartoon characters and each clip delivers a specific message to the users. 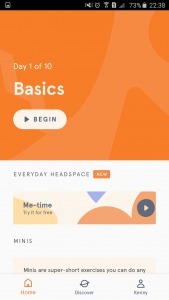 You can download the Headspace for FREE and get unlimited access to the Basics mindfulness tracks that form the foundation of further practice. To get the full access to the remaining contents, you need to be a paying subscriber. Headspace offers an annual plan that cost $7.99/month (paid in full). The Calm mindfulness app has gained positive coverage by the press. Being the app is Tamara Levitt, who has studied and practice mindfulness meditation for 25 years from renowned teachers like Jon Kabat-Zinn and Sharon Salzberg. Her mindfulness journey started when she discovered meditation while undergoing treatment in a clinic for eating disorder. With a background of animated lake and serene sound of the forest, the app has a minimalist layout with buttons of Music, Meditate and Sleep at the bottom of the screen. The available selections of various contents are represented by beautiful images and respective titles. The guided meditation tracks on Calm averages around 15 minutes. Besides the introductory course to mindfulness, there are guided meditation tracks for common issues in our life, like anxiety, stress, and self-esteem. This app is a great way of introducing mindfulness into every part of your life. Besides mindfulness, Calm also teaches the loving-kindness meditation, a type of meditation that invokes compassion and unconditional love. This type of meditation is effective if you’re having issues with anger management. The loving-kindness meditation complements the mindfulness practice perfectly. True to its name, Calm is more than a mindfulness app. It has a section that offers hours of calming music for relaxation, sleep or focus. Besides that, there is also a dedicated library of bedtime stories for adults and kids alike. It helps to take your mind off the usual worries for a good night of sleep. A portion of the contents in Calm can be accessed for free with no annoying advertisements. Calm also offers paid subscriptions that start at $4.99 per month on a yearly basis that allows unlimited access to all its content. The Mindfulness App is the brainchild of a couple of mindfulness and yoga enthusiasts, Martin Wikfalk and Magnus Fridh, who wishes to make the world a place filled with love. The app has been used by millions of mindfulness practitioners all over the world. Users can easily browse the contents of the app by scrolling down the single page menu. All the programs are categorized with a short description that explains the purpose of the contents within. There’s also a search button that helps you to find your favorite meditation track quickly. Meditation is the core of the entire app. New users of The Mindfulness App are prompted to start with the basic 7 Days mindfulness course. There’s also a Timed Sessions that guide users to meditate in silence for up to 30 minutes. There are also various packs of meditation tracks and courses to choose from. The meditations on specific issues like stress relief are guided by various mindfulness teachers. Courses are longer programs that you may take hours to complete. The app has a tracker and reminder that helps you to keep your practice consistent on a daily basis. It also has a unique daily mindful notice where it will prompt you with messages that help you to increase your awareness. You can access the 5-Day Introductory Mindfulness Course for free but a premium subscription is required for full access. A year of premium membership will cost $79.99 that unlocks all contents including a 10 Day mindfulness program with renowned teachers like Tara Brach and Jack Kornfield. Stop, Breathe and Think is a mindfulness app that supports the cause of non-profit Tools For Peace. It aims to train inner-city teens the skills of mindfulness and meditation. It simplifies mindfulness that kids as young as five could start learning the practice. The app itself has a very clean and structural menu, differentiated with different colors. 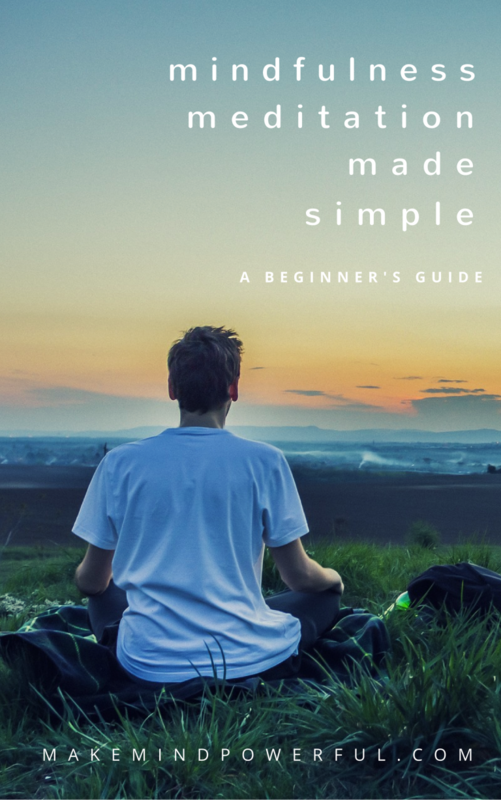 There is a section of introductory notes on mindfulness and meditation which can help beginners to grasp the concept before starting the practice. It’s a simple app without fancy animations or background sounds. You’ll find a great list of guided meditation tracks that range from mindful breathing to cultivating compassion. Some of the meditation tracks provide the option of shorter or longer duration. A meditation guide explains thoroughly the benefits of each specific tracks. If you don’t know where to start, the app has a Begin button where it would assess your mental, physical and emotional conditions before recommending the appropriate sets of meditation tracks for you. There is also a tracker that tracks the changes in your mood before and after you meditate. Most of the meditation tracks are available for free, although some may cost you a small price to download. The yearly Premium subscription that cost $5.83/month is currently only available for iOS users. 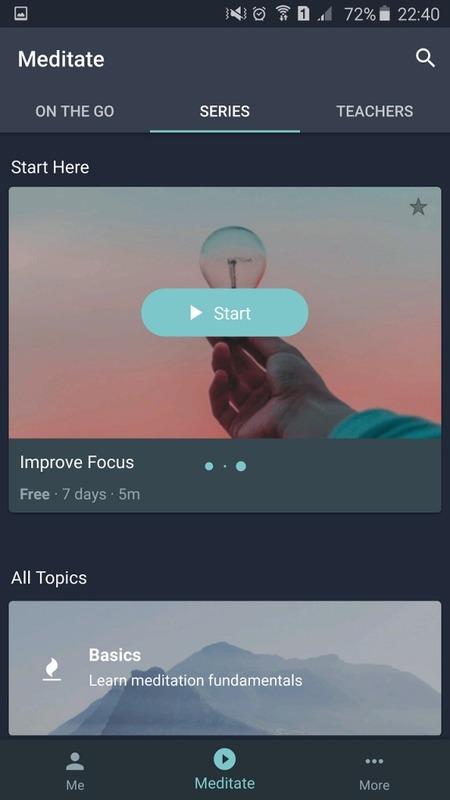 Built by a huge team of meditators, Insight Timer is more of a hub of resources for mindfulness meditation rather than the step-by-step courses offered by other apps. 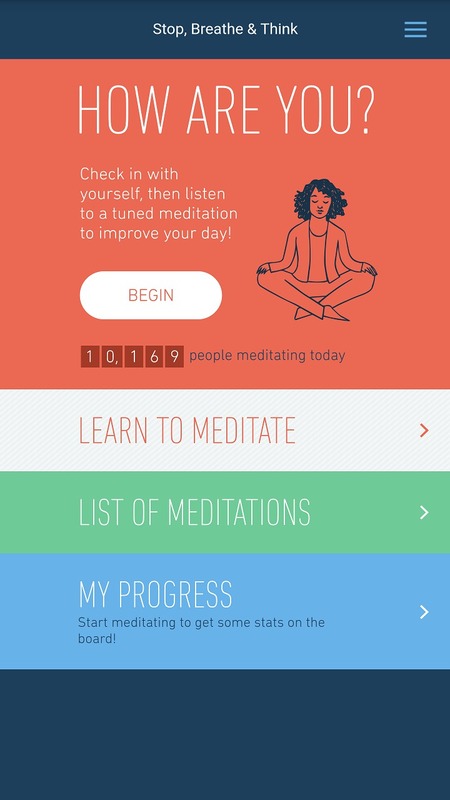 It’s an app that connects meditators and teachers around the world and features over 8,000 guided meditations from the community. The app spots an organized layout with the pages easily switched from a row of buttons at the bottom of the screen. 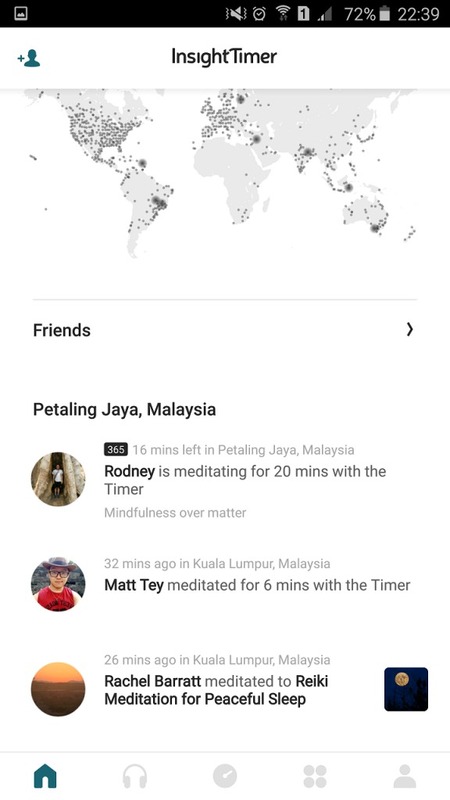 The home screen is a news feed showing users of the app meditating on specific meditation tracks. It lets you connect with like-minded people in a community-like environment. You can browse thousands of meditation track from the Explore page. They are sorted into categories like Popular, Guided Meditations, and Teachers that makes selecting your meditation track easier. Alternatively, you can use the search function on top of the screen. The content libraries are made in such a way that you can select your preferred duration and the specific tracks will be filtered. It’s perfect for people who wanted to slot in 5 minutes of meditation in their busy schedules. The app also has a configurable meditation timer where you can set not only the duration but also the ambient sounds and bells for specific intervals. What separates out this app from others is the focus on mindfulness community. There’s a section where there are over 5,000 groups created by fellow meditators that you can join. Popular groups like Be Here Now and Thich Nhat Hanh has more than 50,000 members. You’ll get basically all the content for free with Insight Timer. But if you wanted to listen to the meditation tracks offline, you’ll have to pay $2.99/month of subscription fee. 10% Happier is a mindfulness meditation app created as a follow up to #1 New York Times bestseller of the namesake by Dan Harris. It brings together top mindfulness teachers like Joseph Goldstein and Jeff Warren to help people use mindfulness effectively in addressing day to day situations. The app has a clean look and arrangement of titles and images just like a what you’ll expect from a well-designed website. The Homepage contains an introductory 8 part video courses on mindfulness meditation with Joseph Goldstein. Or you could scroll down to the collections of featured meditations and courses. You can browse the entire content of the library in the Discover section. There are various courses conducted by experienced mindfulness teachers on the basics and specific issues like relationships and stress. The courses are usually broken into smaller episodes that you can complete at your own pace. There are also hundreds of mindfulness tracks that vary by lengths in the library. Besides basic mindfulness meditation, you can use tracks like mindful eating and commute to bring mindfulness effectively into your daily activities. You can also select your meditation by the duration of the Homepage. A great feature in the app is the Coach section where you can chat with mindfulness teachers for feedbacks and advises. This is useful if you’re just starting mindfulness meditation as sometimes you’ll be wondering if you’re practicing the right way. 10% Happier can be downloaded for free and you can access to its basic course of mindfulness. To unlock other premium courses, you’ll need to pay a subscription of $79.99/ year. You can also check out the 10% Happier best-seller at Amazon here. Simple Habit is the creation of Yunha Kim, a former Wall Street investment banker who found mindfulness meditation a great help in dealing with her stress. She hopes she could reach out and help people who were overwhelmed by stress with the mindfulness app. Spotting a dark background, the app has a clean interface with the tabs for accessing various contents clearly displayed at the bottom of the screen. Navigating within the app is easy as it made full use of graphics and is highly responsive. It has hundreds of meditation tracks that helps beginners to get started and also focuses on specific parts of your life. Yunha Kim clearly has her users in mind when she developed the app. All of the contents are tailored to busy people who are battling with stress each day. Meditation titles like AfterVacationn or Just Landed are a clear example how mindfulness can be applied to our daily life. Most of the meditation tracks are pretty short and averages 5 minutes. They are ideal for busy city dwellers. There’s also a section that lists all the mindfulness teachers and the sessions that they have conducted. If you feel the style of a particular teacher suits you, you can check out their other sessions. With more than 50 mindfulness teachers, you can expect sessions for various level of learning. 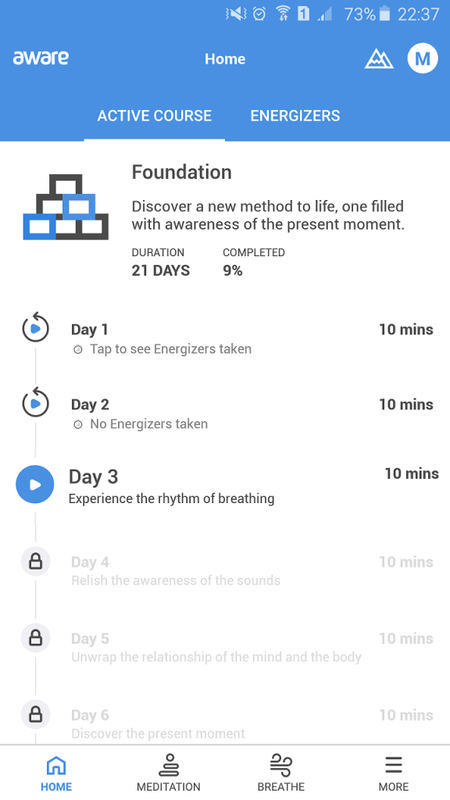 The app has a special “On The Go” feature where you can select from a list of common daily activity and emotions to get the most relevant meditation track. It’s helpful when you’re stressed out and need 5 minutes of calm to keep going. While some of the basic contents are available for free, a premium upgrade is required to access the rest of the library. Yearly subscriptions start at $7.99 per month to meditate without restrictions with Simple Habit. Aware was founded by Avinash Saurabh, who have decades of experienced practicing mindfulness meditation. His aim to make meditation easier and effective for the public was made possible by the support of mindfulness experts around the world in creating the app. The design of Aware is simplistic with the contents highlighted by text descriptions. You can easily browse the apps by the intuitive tabs on the bottom of the screen. The contents are arranged into two broad categories of Meditation and Breathe. Beginners could expect 21 days of mindfulness training as a foundation course before working on mindfulness for other areas of our life. Aware is a mindfulness app that targets mental disorder and has some in-depth mindfulness training in stress, anxiety, and depression. 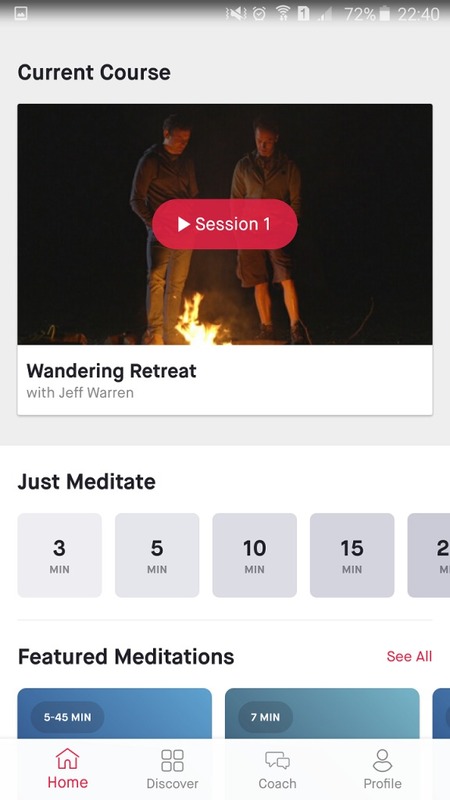 The app also has shorter meditation tracks. The Singles are suitable for daily activities like walking, traveling or cooking and is as short as 5 minutes. They are a great way to inject mindfulness into your routine and increase the awareness of your thoughts. A section name Breathe in the app contains visual and audio guidance for breathing pattern. It has been proven that deep breathing can help a person relax and the app does exactly that. There are various breathing patterns such as those for stress reduction and anxiety management. Aware can be downloaded for free and you’ll get access to some of the basic mindfulness training. Premium subscription that unlocks all the contents of Aware come at a price of $29.99 per year. Read My Full Review Of Aware Here and Get A Special Promo Code. 5 Minute Meditation was created by Olson Apps is a mobile application company to focuses on developing health and fitness app. While little is known about the company or the instructor behind the meditation track, this app deserves a mention as it is a simple and effective way to introduce mindfulness in 5 minutes. There are only two types of contents on the Home screen, Meditation, and Quick Awareness. Selecting the Meditation will bring you to 5 minutes of introductory mindfulness lesson that draws your focus to your breathing mindfully. There are 28 Days of 5 minutes session in total. The Quick Awareness is an exercise to increase your self-awareness by noting different sensations on your hands within 30 seconds. It’s a good way to bring a pause to your hectic life and truly connect with your senses. There are no sign-ups required for this app, which makes it easy for beginners to get a taste of what mindfulness is all about. 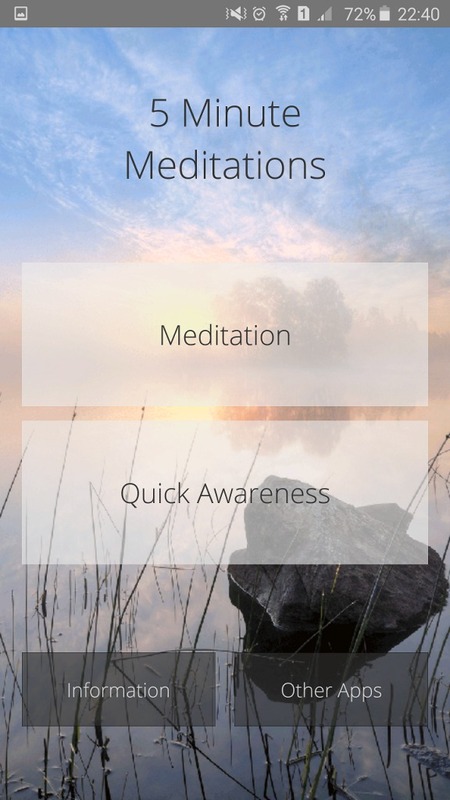 The app is free to download and the first 5 minutes of mindfulness training is accessible. A one-time payment is required to get the rest of the 28 days of mindfulness training. 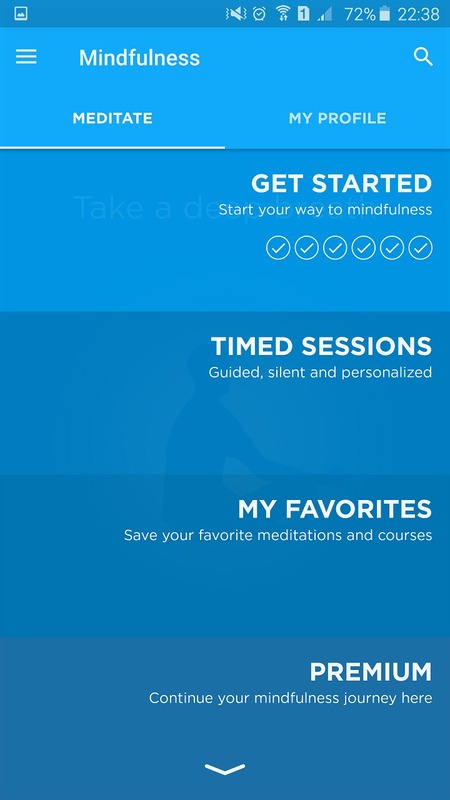 Aura is a mindfulness app created by top mindfulness and meditation experts. It beautifully integrates mindfulness meditation into mobile technology without losing any of its effectiveness. Aura was voted as Apple’s #1 new app in February 2017. The app itself sports an elegant interface that’s both visually pleasing and intuitive. 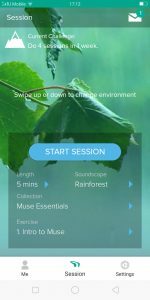 The app is interactive in nature as it will prompt you for your basic information and your emotional condition before directing to your first mindfulness lesson. As the session completes, it checks your mood again and invited you to follow the channel of the meditation teacher. It also provides a journal for you to write down your experience as you continue your mindfulness journey. You can browse the Mindfulness Channels where there are hundreds of meditation tracks by experienced mindfulness and meditation teachers. Some of the channels deal with specific issues in our life such as Mindfulness for Stress & Anxiety and Sleep, Relax and Recharge. It also has a couple of useful features like relaxation sounds which played calming audio of your choice for as long as 60 minutes. There’s also a personal tracker that monitors your progress and the changes in your mood as you meditate. Downloading Aura is free and it comes with a decent amount of free content. A premium upgrade is needed to access the entire content of the app. A 6 months subscription will cost $29.99. You may have heard of Muse, the brain sensing headband for meditation practitioners. But what you may not be aware of is that it has an accompanying meditation app that you can download for free. 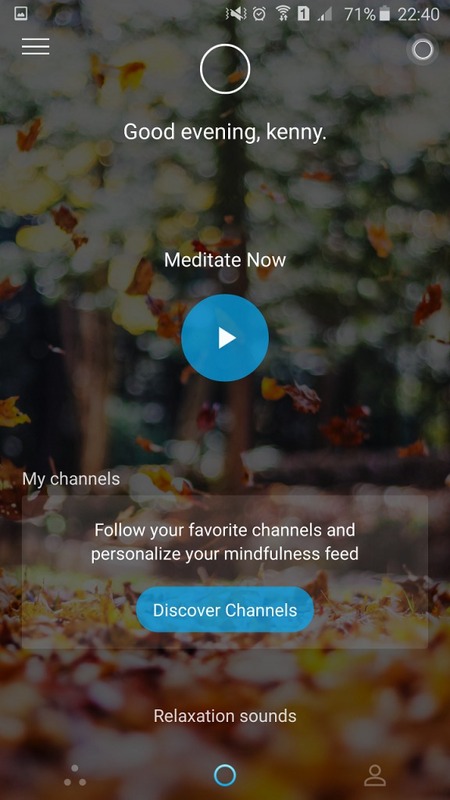 The Muse meditation app is free for download on both Android and iOS devices. While it delivers the best experience with the headband, you can use the app to meditate without one. The app has a simple interface that’s easy to navigate. Starting a meditation is as simple as selecting the duration of the meditation session, background sound, and the intended guided meditation track. Without the headband, it works like any other meditation app. However, paired with the brain-sensing headband, your meditation session will be more dynamic as the app changes the background sound in respect of the signal sensed from your brain. 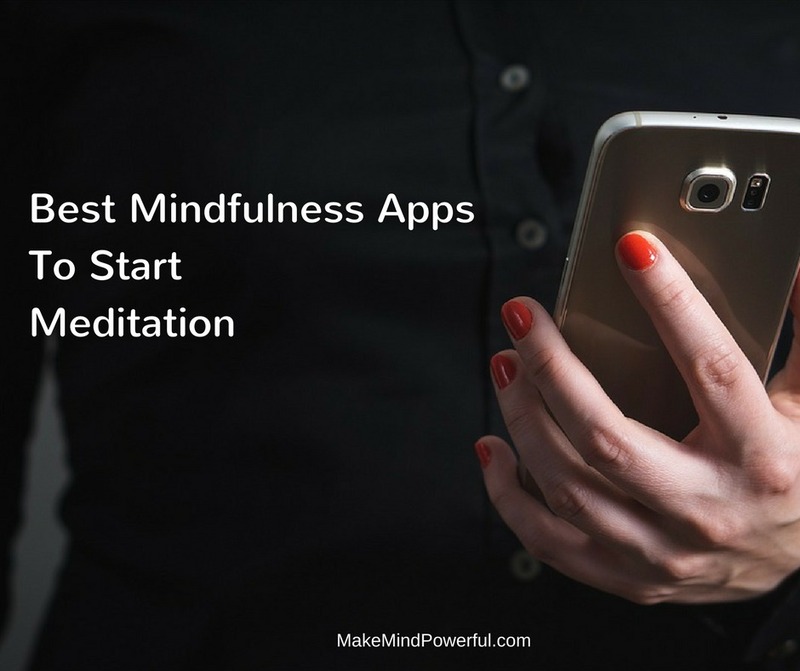 I hope this list of my personal pick of the best mindfulness app helps you in starting your meditation practice. Feel free to share your experience with the mindfulness app that you find effective.